When a pipe springs a leak, it’s important to find its location with a quick and accurate method. Engineers at Echologics — a Mueller Technologies Company — use a combination of acoustic sensors and simulation applications to pinpoint such leaks. Sebastien Perrier of Echologics discussed the benefits of this approach and gave a live demonstration of an acoustics modeling app during his keynote talk at the COMSOL Conference 2016 Boston. If you missed Sebastien’s presentation, you can watch it below. The location of a leak is measured using the time delay between signals captured with two sensors placed on the pipe. The time delay is determined using the correlation function. This technique also requires knowledge of the mechanical behavior of the pipe and the propagation speed of acoustic waves to accurately locate the leak. 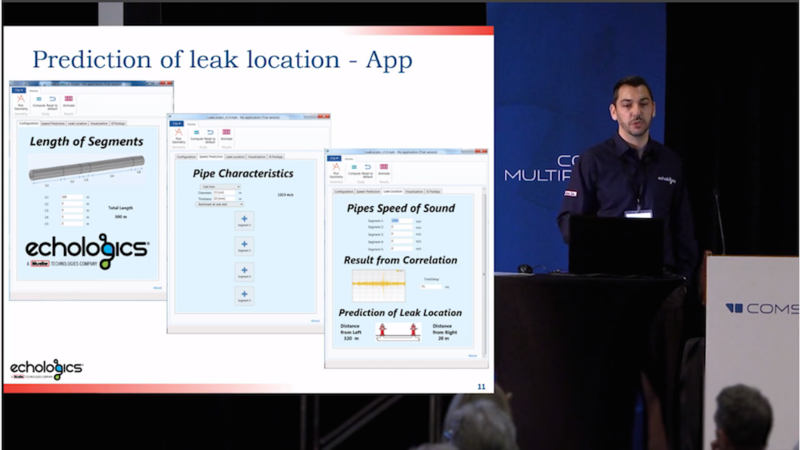 To solve this problem, Sebastien created an app using the Application Builder, a built-in tool in the COMSOL Multiphysics® software, to find the exact location of pipe leaks. He explains that the app is advantageous for Echologics because its user interface is designed for ease of use in the field. This includes app dimensions that could easily fit on a tablet device when accessed with the COMSOL Server­™ product, for instance. This is particularly useful for Echologics, as their field engineers travel extensively. 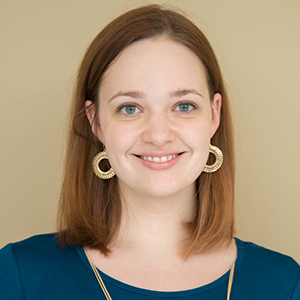 With apps, engineers at Echologics can easily run and rerun analyses. For example, an engineer can predict a leak location in a pipe using the app and contact the client to tell them where the leak is located. If the client recently replaced that segment of the pipe with a different material, for example, the engineer can rerun the analysis through the app and provide the exact leak location based on the new information. This enables them to quickly respond to the customer with an updated location. During his keynote talk, Sebastien discussed how Echologics designed their app so that users can easily navigate its interface. By separating the app into five tabs, field engineers only have to calculate the information they need. For example, if an engineer using the app has already measured the speed of sound in a certain pipe segment, they don’t need to use the Speed Prediction tab in the app. Instead, they can simply input the measured speed in the Leak Location tab that calculates the results. From the video: Sebastien Perrier demonstrates the custom app built by Echologics for predicting the location of a pipe leak. After all of the information is entered into the app, it reports the leak’s location in relation to the two closest sensors. Echologics’ app also includes a Visualization tab so that the app users can see their results. For Sebastien, the beauty of this app is that he can “visualize and confirm” when each sensor detects the leak. Watch Sebastien Perrier give a demonstration of this app in the keynote video at the top of this post.